Nice hotel to stay, clean and fair price. I would definitely repeat when in the area. Friendly, helpful staff. Clean room. Well kept grounds. Nice pool. Love the ease to get back and forth to Disney Springs. The pool here is amazing. Really love all the restaurant options and proximity to the parks! Overall beautiful and clean. Comfortable beds and big rooms for a family to relax in after spending the day in one of the Disney parks. Beautiful place! Everything is outstanding! Everyone so friendly and helpful! Nicely renovated and close to Epcot and Hollywood Studios! Quick boat ride to Epcot or Hollywood Studios. Location is very convenient if you go to Epcot and Disney's Hollywood Studios as they would transport you by water. You can also walk to Epcot and Hollywood Studios but I recommend taking the boats. Epcot® is located in a family-friendly area of Lake Buena Vista known for its fun-filled attractions and popular theater scene. The neighborhood is home to 106 hotels and other accommodations, so you can find something that works for your stay. 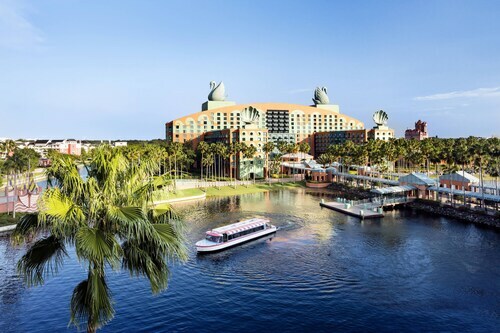 Walt Disney World Dolphin: With a stay at this 4-star resort, guests can enjoy access to 5 outdoor pools and a full-service spa, along with pillowtop beds. Our customers like its family-friendly amenities and beach locale. 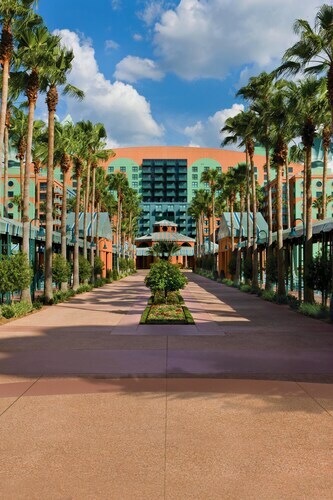 Disney's Beach Club Resort: With a stay at this 4-star resort, guests can enjoy access to 2 outdoor pools and 2 restaurants, along with free WiFi. Our customers like its dining options and clean, comfortable rooms. Executive First Class Home - Free Wifi -princess and Avatar Themed- Golf Views: Amenities in this vacation home include a private pool and a kitchen. Our customers like its pool and comfortable beds. While you're in town visiting Epcot®, you can explore everything there is to see and do within a couple miles of the area. Sights like Disney's Boardwalk and Mary Queen of the Universe Shrine highlight some of the local culture. You can enjoy live performances at La Nouba Theater and Wizardz Magic Theater. Spend some time exploring the natural beauty of Little Lake Bryan, Lake Bryan, and Tibet Butler Preserve. Walt Disney World® Resort, Disney's Hollywood Studios®, and Disney's Typhoon Lagoon Water Park are a few additional nearby sights. Disney Springs® is also located 1.9 mi (3.1 km) from Epcot®, and Walt Disney World® area is 2.7 mi (4.3 km) away.